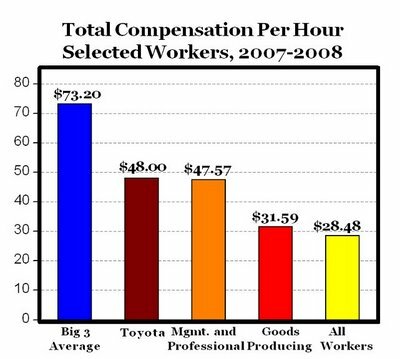 Gateway Pundit provides this chart showing the extravagant auto worker salaries. American auto workers make almost 160 percent of Japanese auto workers wages. And the Japanese produce better cars. UAW’s time has passed. Big Union’s greed has destroyed more jobs in America than anything that’s happened on Wall Street. Let’s let the UAW workers eat cake for a while.